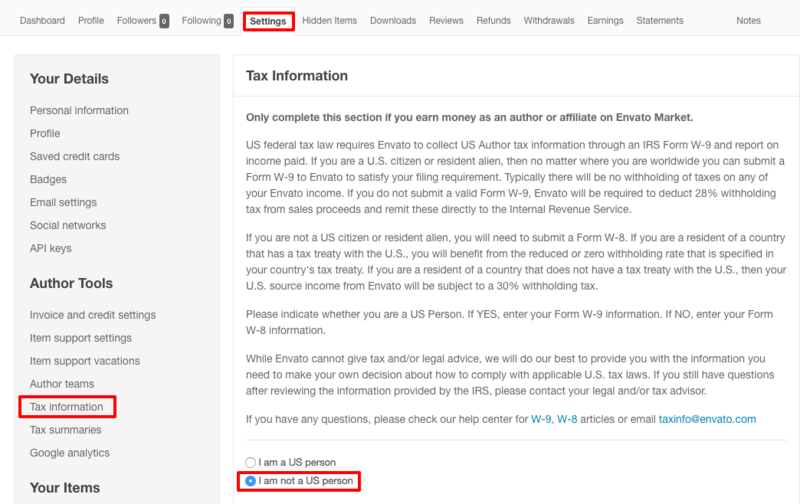 The US federal tax law requires Envato to collect tax information from our authors. While we cannot provide you with tax advice, we have put together this article to help you through the process. This has the caveat that you should always seek advice from a professional accountant/tax advisor because we are not authorised to advise about your specific tax situation, including filling out your specific tax form. Your situation will determine which tax form you need to fill out. US persons are required to fill out a W9 form. Non US individuals will need to fill out a W8BEN form, and non-US organisations will need to fill out a W8BENE form. This article is about the W8BEN form, we have equivalent articles for W8-BEN-E and W9. In the Tax information section, you’ll need to select I am not a US person option. For Registered as, select An Individual option. The first section of the form asks you for your personal details. In this section, please provide details including your name, country of citizenship and postal address in your country of residence. Please ensure that you provide a complete address because we will use this address to send you a hard copy of your Form 1042, which is your US earnings summary for the year. It also asks for your tax identification type and number. You may provide your Foreign Tax ID Number, which is the number that you use when you submit your tax return or pay taxes in your country. If you’re unable to provide your tax identification number you won’t be able to claim a tax treaty benefit and your earnings from US customers will be subject to 30% withholding rate. To find your Foreign Tax ID Number, please see the guidance provided by the various jurisdictions and the OECD here. Alternatively, you may also find the guidance provided by the European Commission. 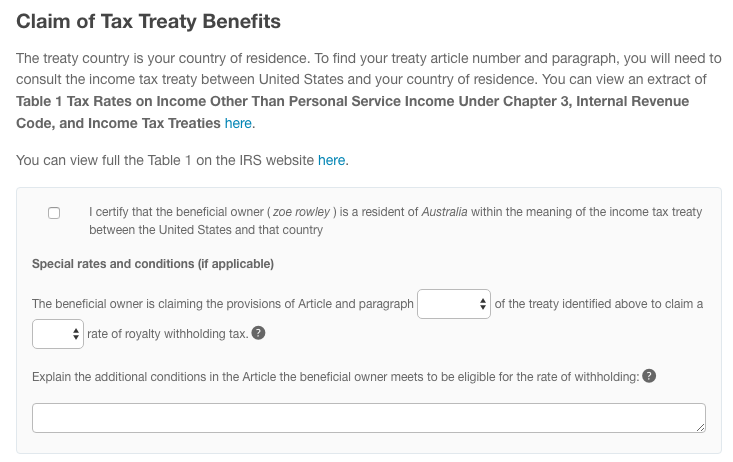 In the second part of the form, if you’re from a country that has a treaty with the US you’ll need to fill out the treaty article number and tax rate relevant to your country. You can find this information in this extract table from the IRS. You can also view the full table on the IRS website. If your country is not on this table, that means your country does not have a treaty with the US. If you’re from a country that doesn’t have a treaty with the US you will not have to fill out this part of the form and we’ll make this easy for you by hiding this section. Even if your country does not have a treaty with the US, it is beneficial for you to submit your tax information. By submitting your tax information, your earnings from non-US buyers will not be subject to US taxes. Note, however, that your royalty income from US buyers will attract 30% royalty withholding tax. 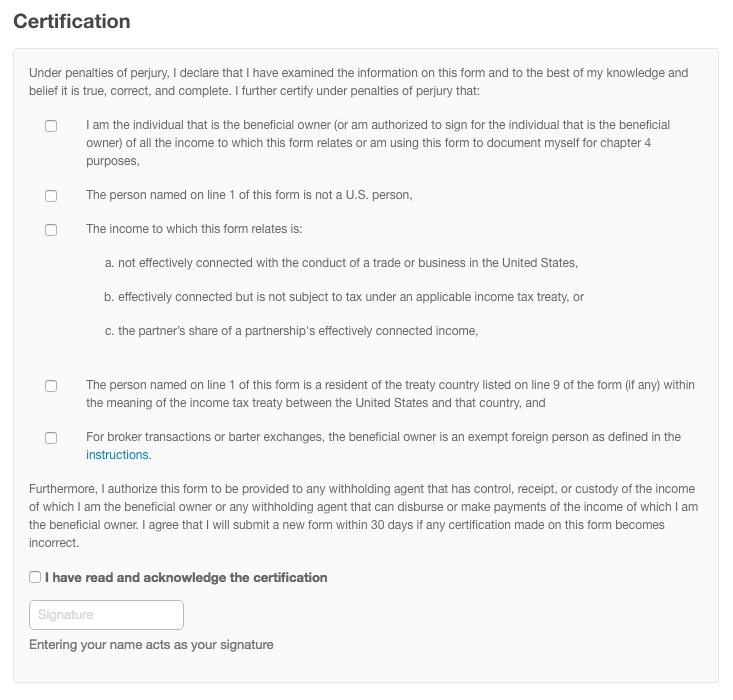 In the final section of the form, you’re required to certify the information you’ve provided is correct. Please make sure you understand all the items under this section. The purpose of the Form W-8 is to establish your identity and status as a non-U.S. person, that you are the beneficial owner of the revenue and whether a lower rate of withholding applies as the result of a treaty claim. Even if your country does not have a treaty with the US, the form is used to establish that you are not a U.S. person. It is important to note that providing false information is subject to penalties under perjury. If you have any questions about this process, please don’t hesitate to contact us at taxinfo@envato.com.